Navy Days 2009 takes place at Devonport Naval Base in Plymouth, Western Europe’s biggest Naval Base, over the weekend of Saturday 5th and Sunday 6th September. The theme will be ‘Present & Future Capabilities’. 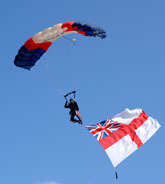 The event will feature Royal Navy Warships open to the public, a river display involving a dramatic hostage rescue and flying and static aircraft displays. This is your opportunity to meet the Royal Navy and see first hand how we operate. You will be able to climb aboard some of the most advanced ships and submarines in the world, see how the sailors and marines live and how cutting-edge technology is transforming the way the modern Royal Navy operates. To mark the Fleet Air Arm celebrating 100 years of Naval Aviation, naval and military helicopters and aircraft will be showcased in the air display including the Black Cats helicopter display team and the Royal Navy Black Sea Hawks. The show will also include military displays, bands, trade exhibits, careers information, craft and produce exhibitions, picnic areas, military vehicle exhibitions, simulators, and much more. The Future Navy exhibition will showcase the new aircraft carrier and next generation submarines. There will be opportunities to meet and talk with the sailors and marines and hear about their jobs, adventures and recent experiences. It promises to be an exciting, action packed and memorable day out for the whole family.